"Hey you! Come here for a second!" I can't tell you how many times I have this happen to me. One of my friends recently had the opportunity to witness first hand one of these occasions and kindly took a picture. A picture really is worth more than a thousand words. For those of you who don't know me well enough, that is me in the picture above and I do not own a dog. I am wearing my usual winter coat, a beanie, and I just happen to be wearing some skater jeans (they have a zipper not buttons). 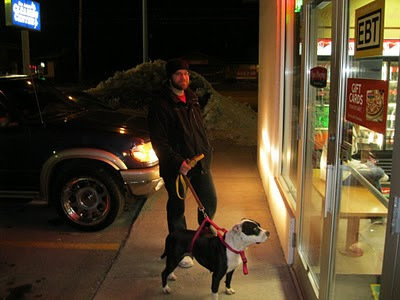 I am also standing outside of Papa Murphy's Take 'n Bake Pizza with a dog named Isabella (aka Bella). Let me back up a bit. For some reason people are drawn to me. No, not like teenage girls are drawn to Johnny Depp, but more like a hungry man is drawn to a hot dog seller. People, random people see me, and then proceed to call out to me. You would think I am used to it by now, but it still catches me off-guard and it takes me a minute to realize that they are indeed talking to me. "Hey you!" "Yeah, you there!" And then its always followed up with "Come here for a second!" I am usually a good distance away, and my survival instincts (and perhaps some mistrust issues) tell me there is a possibility that this person is going to mug me, kill me, or frame me for something. I just don't like the fact that they don't say why they want me to walk over to them. They just expect me to come. I must say that after so many experiences I am getting much quicker at the whole thing. So, I oblige the individual and walk over. This is how Heavenly Father gives me opportunity to serve. One time I helped a man who was fishing. He was older and was fishing off a boardwalk high above the water. He explained that he just likes to catch and release and he had just caught a fish, but when he tried to toss it back, it didn't make it into the water but was laying on the ground a foot or two away. So, he asked if I could climb down and put it back in the water for him. What was I supposed to say, no? I climbed down and did the last thing I was expecting to do that day...save the life of a fish (and perhaps an old man's life as well). Back to Bella. As my friend and I waited for our delicious pizza, the door opens and I hear it. "Hey you!" "Hey L man!" (that's a new one...I still don't know exactly what he said, but it sounded like he called me "L" man). Here we go again, "come here for a sec!" This young man had brought his dog, but wanted to get some pizza. He asked me if I had ordered already. I said we had and he was disappointed. He said that he would have ordered and paid for my pizza if I were to watch his dog for him. I told him I could watch the dog for him regardless. He was very grateful and told me that Bella was very well behaved. And, well...hence the picture. I stood there and waited so that he could order. I really wonder what it is exactly that makes people call out to me. Is it the beard? Perhaps. The amazing sparkle I have in my eye? Could be. If you are reading this young man with the dog named Bella, or the old man who likes to catch and release...could you answer this long unanswered question? Drama, Mystery, and Romance. Starring Edward Norton, Jessica Biel, and Paul Giamatti (along with Rufus Sewell). A similar feel to The Prestige which also came out in 2006, both movies are really well done and both are great movies. I may do a review on The Prestige later after I have had the chance to watch it again, but I do have to say that The Prestige may be rated a tad higher (mostly because of cast, acting, and originality). I mean can Edward Norton, Jessica Biel, and cast compare with the cast of The Prestige (Michael Caine, Christian Bale, Hugh Jackman, Scarlett Johansson, pop legend David Bowie, and Gollum (or better known as Smeagol to his friends). Anyway, that is for a different review. The Illusionist has really amazing cinematography and even though the mystery is a little less of a mystery than I would say The Prestige is, it is still highly original and clever. It was like watching a really amazing magic show all the while you have an inspector (Giamatti) trying to solve and understand the workings of the illusionist. A lot of great movies have an inspector or cop involved in them (most of the good ones starring Tommy Lee Jones as the said cop or investigator (doesn't hurt to have Harrison Ford either) - p.s. for all of you MIB fans...MIB3 is in the filming stages). Anyway, this movie is visually amazing, the story is good, the acting is good, the music is ok, and overall, it gets 4 fingers up! Professor Plum with the revolver in the conservatory or was it Spencer with his revolver lighter in Granger High School? Clue, a classic game of logical deduction. We all know from the game of Clue and many hours of CSI how difficult it can be to solve a murder. Sherlock...Watson... these are some men that can appreciate the reasoning and thought behind solving a murder. Well, in Kill Dr. Lucky (the board game) you and your friends are invited over to Dr. Lucky's mansion. Poor Dr. Lucky won't be too lucky tonight. You and your friends (for whatever personal reasons you have with the old chap) are all very eager to kill Dr. Lucky. Maybe it is to silence him or to gain some of his wealth. In the game, each of you wander the house looking to acquire the best or most convenient murder weapon, and most importantly find Dr. Lucky alone. But wait! Everyone else wants to have the pleasure to themselves and they will do everything to stop you from your plans. An enjoyable game for 3-7 conspiring players. The concept is a bit morbid, but fun. Not a perfect game by any means, but a good one. And that is How Lou Sees It.